We are more then just your average machining shop. Bryan Tool & Machining provides turn key solutions for all your industrial needs, from new equipment design/build, to maintaining and upgrading existing equipment. 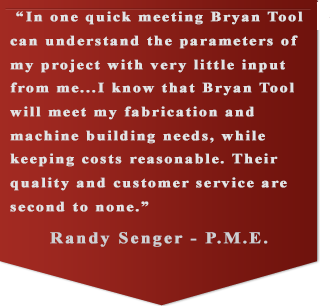 Bryan Tool and Machining, a veteran owned and operated business, believes in doing business the old fashioned way, but that doesn’t mean that we are just a simple machine shop. Our experienced team is dedicated to helping enhance and improve your work flow. We can do this by troubleshooting existing systems to increase efficiency, providing the necessary fix or making something from scratch. Our products are made in America.